Measles (sometimes known as English Measles) is spread through respiration (contact with fluids from an infected person's nose and mouth, either directly or through aerosol transmission), and is highly contagious—90% of people without immunity sharing living space with an infected person will catch it. The infection has an average incubation period of 14 days (range 6–19 days) and infectivity lasts from 2–4 days prior, until 2–5 days following the onset of the rash (i.e. 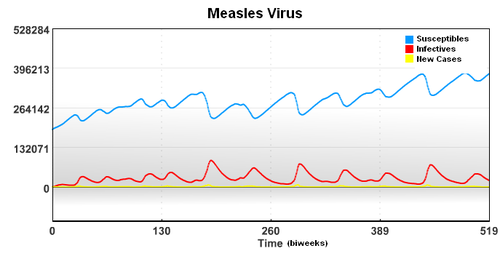 4–9 days infectivity in total). Understanding the spread of the measles virus from historical data of major metropolitan areas will help researchers understand the fundamentals of disease spread through a population. This may help guide policy for school closure, travel restrictions, and other measures intended to slow disease spread until a vaccine can be developed or deployed. In this case, the starting population of 3,200,000 is composed of a group of Susceptible, Infected, and Recovered individuals. 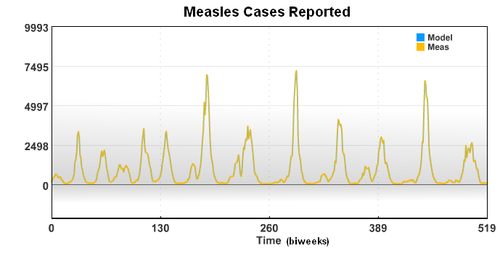 To account for underreporting of measles cases, a reporting factor is used in the model. In this study, it is assumed that only 45% of the measles cases were reported. The new case data shows a seasonal variation that is caused by an increased rate of contact between the susceptible population and the infective population. 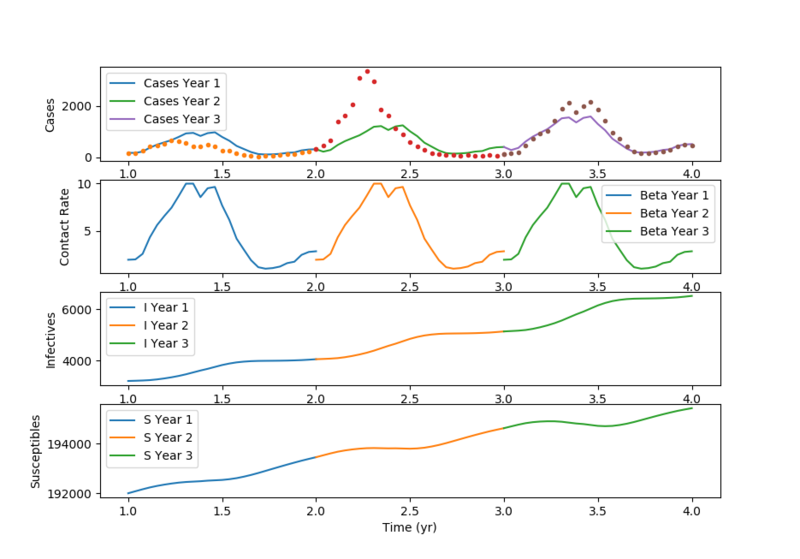 Based on the new case data (cases), birth rate (mu), and recovery rate (gamma), the seasonal variation of the transmission parameter is estimated over a period of 20 years. 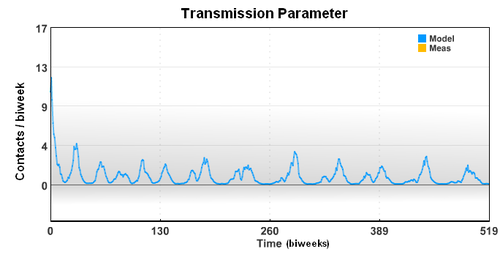 The seasonal transmission parameter can also be used to estimate spread of other diseases. The transmission parameter is the number of contact (on average) made with other individuals during a biweek period. The transmission parameter can sometimes be decreased for brief periods of time to slow the spread of a disease. Also, the number of susceptible individuals can be reduced through the use of vaccines. In the case of limited vaccine supply, disease spread models can help identify the best use the resources to limit large outbreaks.
! Data from London is 1944-1966? Thanks to Cameron Price for providing the GEKKO Python code. Daniel P. Word, George H. Abbott, Derek Cummings, and Carl D. Laird, "Estimating Seasonal Drivers in Childhood Infectious Diseases with Continuous Time and Discrete-Time Models", in Proceedings, 2010 American Control Conference, pp. 5137-5142, Baltimore, MD, June 29 - July 2, 2010. Daniel P. Word, James K. Young, Derek Cummings, Carl D. Laird, "Estimation of seasonal transmission parameters in childhood infectious disease using a stochastic continuous time model", Computer Aided Chemical Engineering, pp. 229-234, 28, 2010.